Weddinghousehold.com - With all the diversified cultures in the world, there are varieties of traditional bridal wedding dresses wore by brides around the world. Definitely, a wedding dress is the most essential part of a wedding for the grooms and the brides. After all, the wedding dress is something what makes the bride look stunning on her ‘big day’! It is a personal and special occasion and every bride is anxious about the shape of the dress, its length, and the shoe height just being the same. And in view of the fact that women, especially on their wedding day across various continents embrace the traditions of their families and cultures, so, each celebration is spectacularly amazing and exclusive in its own way. 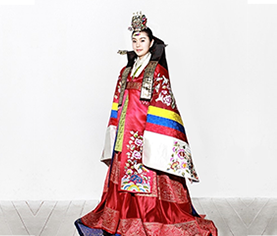 Korean brides wear the Hanbok or Joseon-ot which is usually made out of white cotton, silk or a scratchy coarse fabric called hemp and characterized by lively colors and simple lines without pockets and consists of the jeogori -a short jacket with long sleeves with two long ribbons on top of the chima- a full-length, high-waist, wrap-around skirt. It is usually worn after the wedding ceremony. Generally, pair of boat-shaped shoes with white socks is worn that completes the outfit. The bride’s attire might include a white sash with significant symbols or flowers. It is the Korea’s national costume. 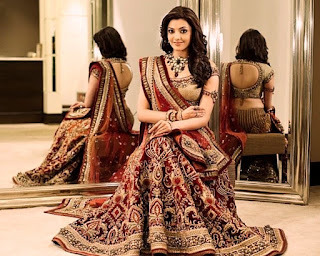 Mostly the brides in India wear a saree or a lehenga but the actual garment the bride wears will vary depending on the region as well the culture. The type of jewelry may also vary. Traditionally, red is regarded to be the most auspicious color amongst Hindus. While the saree is preferred as the bridal dress in South India, West, East India, in most other parts of India brides prefer Lehenga, Gagra Choli and Odni or Dupatta as bridal dress. The bride wears a 16-piece attire called as Solah Shringar whichincludes make up, jewelry, and clothes. Each item is meant to bring out the natural beauty of the bride. One outstanding piece of the Solah Shringar is the Mangtikka, which is the jewel the bride wears on her forehead and through the part of her hair. Traditionally, Chinese brides from Northern China wore the traditional Qi Pao which is a bright-red silk one-piece frock with intricate gold embroidery. These are generally loose, high-necked, long-sleeved gowns that fell all the way to the ground and display only the bride’s head, hands and toes. In southern China the brides traditionally wear a two-piece dress named as Gua, Kwa or the Chengsam. 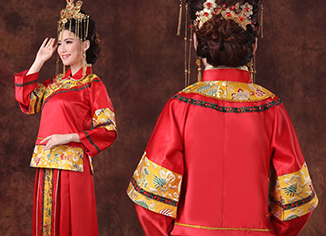 These dresses are often designed with dragon and phoenix motifs where dragon represents power and is worshipped by Chinese since ancient time. The combination of dragon and phoenix symbolizes the balance of male and female power. A traditional Malaysian wedding dress is commonly called as Baju Kurung– a knee-length blouse worn over a long skirt and is usually a bright colored dress with various printed designs. 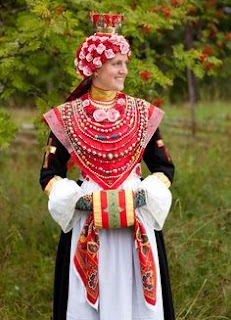 The blouse is long-sleeved and collarless whereas the skirt is called as a kain that has pleats on one side. At times, a headscarf is worn with this. Now days, bridal gowns range in every color of the spectrum, but most wedding outfits, will include a crown-like head piece that represents the brides as the queens. Many Muslim brides from the country, incorporates the hijab into their outfits. A Swedish bride will wear three bands, one for her engagement, one for marriage, and one for motherhood. She will also wear a tiara that symbolizes her virgin status, though in the past these tiaras were actually the crowns made up of myrtle leaves representing virginity. A traditional Swedish bride as a tradition might keep a coin in each shoe, a gold coin from her father in her right shoe and a silver one from her mother in her left shoe guarantying that she would never go without. The Swedish bride will traditionally carry a bouquet which was typically made of the strongest smelling flowers to ward off trolls and other evil creatures. Traditional Japanese wedding attire is called as kimonos worn by brides for their wedding ceremonies. During the formal ceremony, brides will dress in a traditional pure white kimono which symbolizes purity and maidenhood. However, they will generally change into a red kimono for the events after the formal ceremony for good luck. Over the kimono, they wear an elaborate silk robe known as uchikake, which is embroidered with delicate designs including flowers and cranes. 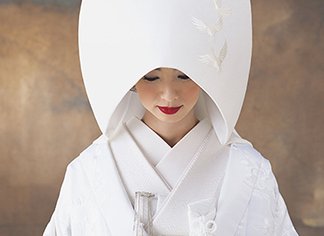 A traditional Japanese wedding attire also includes tsunokakushi which is a wedding headpiece to be wear with a kimono. 2 Responses to "Traditional Bridal Wedding Dresses Around The World"
The valentine's day bouquet I sent to my love. I ordered it at 11:00am and it was delivered at 2pm!!! Beautiful Flowers Delivery! Simply stunning! I will definitely be bringing my business back to this gem of a florist.